Introduction: In recent years many investigations have been accomplished in the field of photocatalysis for decomposition of organic matters and other pollutants in order to achieve stringent discharge standards. Therefore, making an assessment on the wastewater treatment processes through photocatalytic reactors seems to be an interesting option. Objective: In this study, we discussed the various methods and patents used for the synthesis of photocatalyst, kinetics of reaction, and the effects of operative parameters. Method: Photocatalytic reactors, several type of photocatalysts, and synthesis method of nanoparticle photocatalysts have been explained. Result: Improving the photocatalytic efficiency by electrical current, advantage of mixing, doping of photocatalyst, photocatalytic process kinetics, and parameters affecting the photocatalytic process such as temperature, initial concentration of pollutants, catalyst concentration, pH, UV irradiation intensity, solution stirring intensity, as well as, addition of hydrogen peroxide have been reviewed. Conclusion: UV irradiation and visible light are necessary in photacatalytic process. 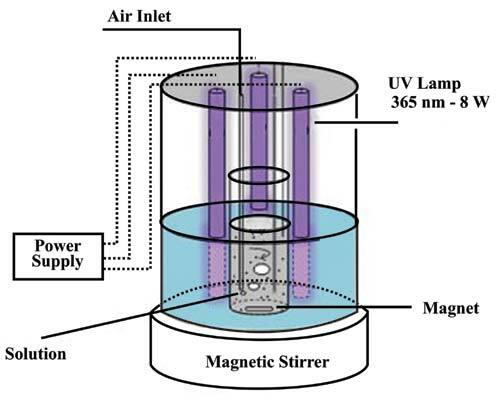 In some cases, increase in stirring intensity caused great enhancement in photocatalytic process. Further, addition of H2O2 increases the rate of photocatalytic process. Kinetics of photodecomposition of organic pollutants usually is first order. Kinetics, nanoparticles, patents, parameters, photocatalytic, treatment, wastewater.